Alexander Mikaberidze paints the picture of the development of the relationship between Napoleon and Tsar Alexander from the time of its honeymoon at the 1807 Treaty of Tilsit, through its deterioration to the inevitable, horribly messy divorce, in 1812. The chief culprit for this estrangement was Napoleon’s Continental System, whose avowed aim was the commercial aggrandisement of France at the expense of the economies of all other nations of Europe. This did indeed bring Russia close to the brink of ruin, leading to Alexander’s opening of his harbours to vital and lucrative trade with England and thus his abandonment of Napoleon’s system. Napoleon could not allow this challenge to his power go unpunished, or it would have made his impotence clear for all to see and flout in similar manner. Thus the stage was set for the historic showdown. The author covers the preparations for the invasion of Russia and the strategic groupings of the opposing armies at the start of the invasion. For the first time, there is included a wealth of Russian eye-witness accounts of the confused state of the Russian defensive thinking, the intrigue, plotting, xenophobia and back-biting, which was the everyday menu of fare in the higher echelons of Alexander’s military command. A forward defence or the more flexible approach of a withdrawal, deep into a deserted Russia? The debate is well documented. Clearly shown is the immense strain placed on the Russian generals by the use of the latter tactic, supported again by many more Russian accounts, seen for the first time in English. 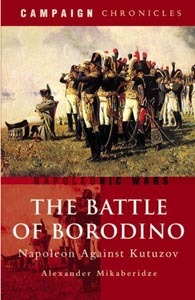 The actions at Schewardino and the main battle of Borodino are similarly fleshed out with personal accounts from all nations involved, giving some impression of the intensity of the bloody action on those days. It is tempting to think how the Duke of Wellington would have handled the defence of that stretch of terrain; no doubt the defenders’ casualties would have been far, far fewer and those of the attackers’ much higher. The change of management style between Barclay de Tolley (calm, disciplined, rational) and Kutusov (cunning, devious, political to the fingertips, meddling in the established command and control mechanisms, with his personal interests well to the fore) is well demonstrated. The story of the fall of the Rajewsky battery is covered in detail, finally clarifying just which cavalry regiments actually were involved. A new aspect of this great event is an analysis of the telling and re-telling of Russian historians’ versions of the battle during the Soviet era. Included are 12 maps, 12 diagrams, two highly-detailed orders of battle, numerous statistical analyses of the opposing forces, an extensive glossary and an index, as well as scores of black-and white portraits and battle scenes, all packed in to this— the ultimate work on this important battle. All the maps are clear, relevant and well laid out. Reading this extensive work is not for the faint-hearted, but it is very well worth it.